As sequels go, we've seen plenty of flops and disappointments, however, unlike Star Wars, this Episode II is no clone! The Held Phantom II Gloves exhibit some serious research and development that leave us with an improved and updated product, with the familiar look and feel. The most important factor to this Phantom sequel avoiding failure is keeping the incredible fit that allows for all-day comfort in a track-day glove. Held assures us that they have kept this attribute true to heart. At this point, half the battle is won since this was the original Phantom's greatest asset. However, the Phantom II sets itself apart with several engineered improvements to bring honor to the name of the Phantom. 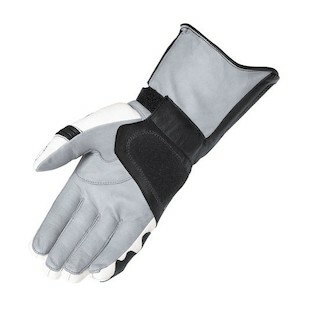 intuitive tunnel strap still fastens the glove. New for the Phantom II, we see the addition of superfabric across the design. The protective armor pieces across the wrist and backs of the fingers are superfabric backed with a carbon-fiber weave. The knuckles have been upgraded to Titanium, which is infused into plastic and backed with a foam lining for optimum comfort and energy absorption. Ergonomically, the wrist panel design has been changed to offer more strategic coverage of your all-important wrist bones. Moreover, the thumb, index, and middle fingers now incorporate accordion stretch panels for better mobility. At the initial release we should see Black, White/Black, and White/Red available in the US. Other colors are currently Europe only, however, we will whine, kick, and scream to try to get a few pairs of Black/High-Viz. Standard sizes are expected to trickle in around March with long and short sizes possibly becoming available later in the year. 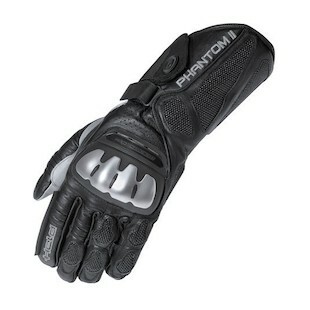 Its often hard to describe why Held gloves have the upper hand in the motorcycle market - they just do. Why would you buy a Ferrari? The years of care and tradition passed down in this family owned and operated company shows clearly on their sleeve. In addition, over half of the manufacturing process takes place in Held's own factory in Germany, while the rest is stitched together next door in Hungary.